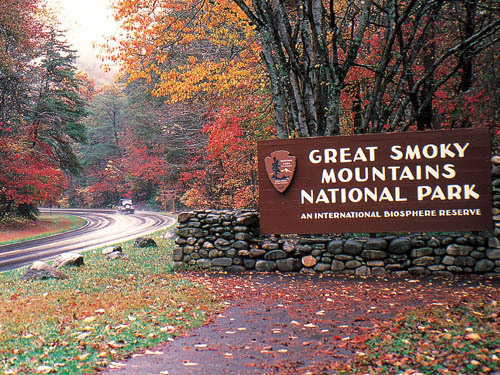 Welcome to the Great Smoky Mountains National Park Information Page. Great Smoky Mountains National Park has over 4,000 species of plants that grow there. A walk from mountain base to peak compares with traveling 1,250 miles north. Several resident plants and animals live only in the Smokies. It also has a rich cultural history. From the Cherokee Indians, to the Scotch-Irish settlers, this land was home to a variety of cultures and people. Many historic structures remain standing. Subsistence turned to exploitation as logging concerns stripped the region of timber. Recovery is now the dominant theme. There are 9,000,000 visits per year. The National Park Service must balance the needs of the land with the desires of the people both today and for the future. The nearest major airports are Charlotte, North Carolina and Knoxville, Tennessee. There are smaller airports located at McGhee-Tyson in Alcoa, 45 miles west of Gatlinburg, Tennessee and Asheville Airport is 60 miles east of Cherokee, North Carolina. There is no train or bus service. Several major highways lead to the Park. The following routes provide access to the three main entrances. Take I-81 South to I-40 South to Highway 411 South (Exit 407 Sevierville) to Stateroad 66 South, and continue to Highway 441 South to the Park. From Knoxville take I-40 East to exit 386B to Highway 129 South to Alcoa/Maryville. At Maryville proceed on Highway 321 North through Townsend. Continue on Highway 73 to the Park. Take I-40 West to Highway 19 West through Maggie Valley to Highway 441 North at Cherokee, follow 441 North into the Park. From Atlanta and points south, follow Highway 23 North and US 441 North to Highway 23 North to Highway 441 North to the Park. Congress established the Great Smoky Mountains National Park on 15 Jun 1934, and turned its stewardship to the National Park Service. Land acquisition continued and on 02 Sep 1940, President Franklin Delano Roosevelt officially dedicated the park. In 1923 when Mrs. Willis P. Davis of Knoxville visited the American West, she fell in love with America’s National Parks. Mrs. Davis felt the Smoky Mountains were worthy of such status. It is with this thought the Park Movement was born. Europeans first settled Cades Cove in 1818. Most migrated from the Watauga Settlement in northeast Tennessee. Before their arrival, Cades Cove was part of the Cherokee Nation. The Cherokee called the cove Tsiyahi, “place of the river otter.” In addition to river otters, elk and bison lived in the Cove. Hunters extirpated them before settlement. The Cherokee never lived in the Cove, but they used it as a summer hunting ground. Arrowheads are common throughout the Cove. Before the American Revolution, the Cherokee discouraged settlers. After the defeat of their English allies, they sought peace. Most Cherokees accepted this peace and the new United States government. They tried to integrate European technologies and culture with their own. The Cherokee adapted well. They built modern houses, attended school, and by 1820 they created a written language. The 1830 U.S. census showed more than 1,000 slaves working on Cherokee plantations. Cades Cove is open sunrise to sunset, year-round, except during snow and ice removal. There are restrooms at all park visitor centers. A new fully accessible nature trail just south of Sugarlands Visitor Center on Newfound Gap Road is now open. Ask at a visitor center for complete information. All backcountry campers need a free backcountry permit. They are available at most ranger stations and visitor centers. Anyone staying overnight in the backcountry must camp in a designated site or shelter. Over 100 sites and shelters are located in the park. Campers need reservations to stay in all 16 shelters and at 14 other sites. To reserve a site or shelter, call 423-436-1231. The reservation office is open seven days a week during business hours. Bike riding is an increasingly popular method of touring the Cove. Great Smoky Mountain camping is primitive by design. Ten campgrounds operate in the Park. Besides sites nestled in the woods and along rivers, all campgrounds provide cold running water and flush toilets. No hook-ups are available in the Park. First aid is available in the Park. Numerous medical facilities, including clinics and hospitals, are near the Park. Entrance to Great Smoky Mountains National Park is free. Due to deed restrictions imposed when the Park was established, there are no entrance fees. Activity Fee – Front Country Camping -$12-20 a day. Anglers 13 years and older (16 and older in North Carolina) need a valid Tennessee or North Carolina fishing license to fish in the Park. The Park does not sell licenses. Check with local chambers of commerce for purchase information. No trout stamp is needed. Limited food and supplies are available in the Park. There is a small campground store at Cades Cove. LeConte Lodge serves meals to overnight guests. Gateway communities around the Park provide food services and supplies. The Cades Cove Campground Store offers seasonal limited grocery, deli, and souvenir services as well as bicycle and helmet rentals. As the name implies, the store is located next to the campground at the entrance of Cades Cove. More than 850 miles of hiking trails traverse the Great Smoky Mountains. They range from easy to difficult and provide half hour walks to week-long backpacking trips. The Appalachian Trail runs for 70 miles along the park’s top ridge. Pets are not allowed on any trails except for the Gatlinburg Trail and the Oconaluftee River Trail. Backcountry camping requires a permit. Le Conte Lodge (accessible by trail only) provides the only lodging in the park. Rooms often fill a year in advance. It is perched atop 6,593-foot Mt. Le Conte, the third highest peak in the park. It is opened from mid-March to mid-November. Reservations are required. write Le Conte Lodge, 250 Apple Valley Road, Sevierville, TN 37862. Also, ten campgrounds operate in the Park. Guided programs are conducted seasonally. Please check at the visitor center for times and locations of these programs. The visitor center features free admission to a 20-minute film with Dolby Digital Surround Sound and extensive natural history exhibits. Available facilities include the Great Smoky Mountains Natural History Association bookstore and shop, public restrooms and telephones, soda and water machines, and a backcountry permit station. Available facilities include the Great Smoky Mountains Natural History Association bookstore and shop, Townsend and local area information, and public restrooms and telephones. Prepare for changing conditions. The Cades Cove annually receives about 55 inches annual precipitation. Much of this falls in winter and spring. Summer rains often come as afternoon thunderstorms. Snow can fall anytime between late December and early March. Annual snowfall averages 18 inches. March has the most changeable weather; snow can fall on any other day, especially at the higher elevations. Backpackers are often caught off guard when a sunny day in the 70’s F is followed by a wet, bitterly cold one. By mid-to-late April, the weather is milder. By mid-June, heat, haze, and humidity are the norm. Most precipitation occurs as afternoon thundershowers. In mid-September, a pattern of warm, sunny days and crisp, clear nights often begins. However, cool, rainy days also occur. Dustings of snow may fall at the higher elevations in November. Days during this fickle season can be sunny and 70 F or snowy with highs in the 20s. In the low elevations, snows of one inch or more occur one to five times a year. At Newfound Gap, 69 inches fall on the average. Lows of -20 F are possible in the high country.